Does Stallion do site prep and concrete work? Stallion Buildings does not do the site prep or concrete work if your site requires any. We are happy to try and refer you to someone in your area if we are able. If your area needs preparation to make it level for installation or a concrete slab, please ensure you have those items taken care of prior to scheduling your install. Should the site not be ready when they arrive, additional labor costs and/or a restocking fee may be applied. How does your metal compare to competitors? All Stallion Buildings come standard with 29 gauge metal that ranges on the high end of the decimal range of thickness. This can be as much as a 40% difference from other companies that come standard with mid to low range 29 gauge. The steel panels we use are Grade E, 80 KSI, rated to withstand 80,000 pounds per square inch. Other companies come standard with Grade C, 33 KSI steel panels. Does Stallion Buildings offer Rent-to-Own? Yes! Stallion Buildings proudly offers rent-to-own (RTO) on all their products under $15,000. With RTO, there is no credit check and the upfront costs are minimal. Simply put a 15% security deposit and first month’s rent down at time of transaction and once the product is installed, you begin making your regular monthly rent payments. You have the option of paying off early for a discount or making the minimum payments each month for the term length. How long will it take for installation? At Stallion Buildings it is our goal to provide you with top quality products and workmanship as quickly as possible. Due to the high demand of Stallion Buildings products, installation time may vary depending on the time of year, however on average it will range about 4-6 weeks lead time. Option 2: Concrete pad with a 1.5-inch ledge. For example, if you purchase a 20X30 unit, build a concrete pad that is 20’ wide by 30’ in length and have your concrete contractor make a 1.5-inch ledge all the way around. This will make your slab 3 inches longer and 3 inches wider than the base. This will allow the metal to go down past the floor to help keep water from coming in at the bottom. In construction terms, this is similar to what is called a “brick ledge”. In total, with the ledge, the slab will be 20’-3” X 30’-3”. Inquire if you need any special building permits. Some counties or towns have websites you can visit for all the paper work needed (if any) before installation. Site preparation is critical to a problem-free installation. Remember, by having a cleared and ready, you will avoid a return trip fee or 5% of the unit price. Call us if you have doubts about your readiness for installation. Most times yes and most counties require the home owner to get their own permit. Stallion will gladly provide customer with the plans that the permitting office may require in order to issue a building permit. Each permit office has different requirements and we will do our best to assist you. 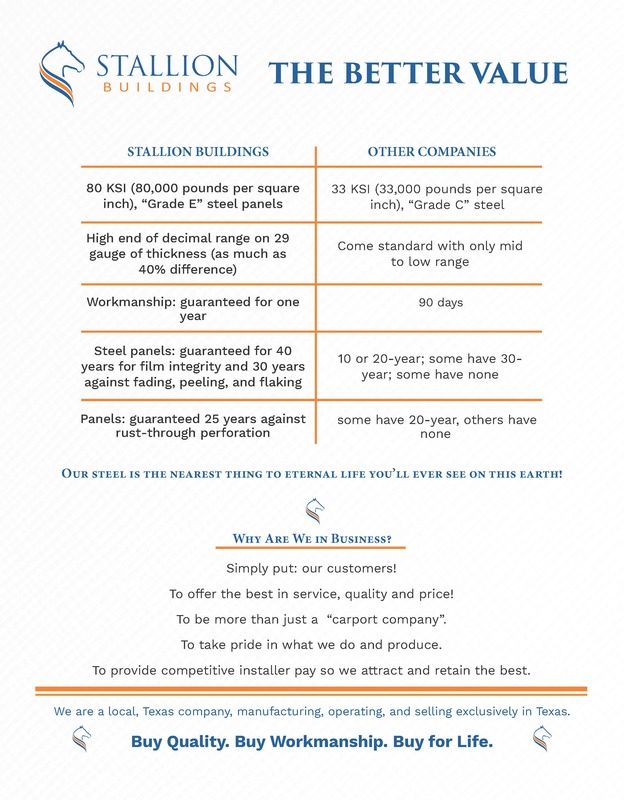 Stallion Buildings workmanship comes with a one year warranty, where other companies only warranty their workmanship for 90 days. Our steel panels are guaranteed for 40 years for film integrity, 30 years against fading, peeling and flaking, and 25 years against rust-through perforation.